A companion text to a piece of online activist rhetoric, this essay attempts to explain how social media networks and other digital interfaces intercede and influence users’ constructions of gender and consumer identity. Gaining awareness of the influence networks have over our lives should empower users to appropriate and subvert those networks for alterior agendas. 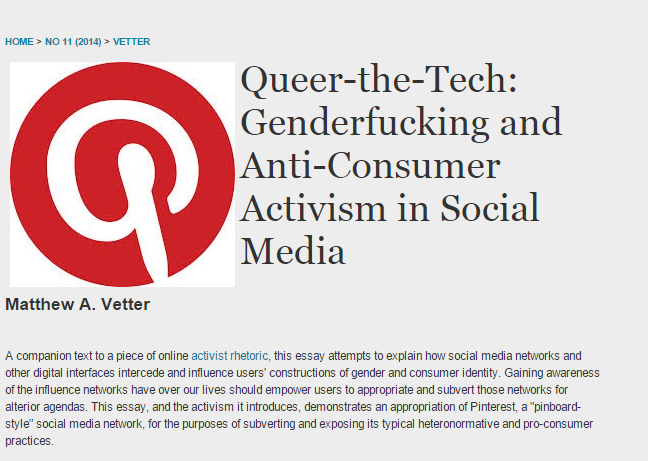 This essay, and the activism it introduces, demonstrates an appropriation of Pinterest, a “pinboard-style” social media network, for the purposes of subverting and exposing its typical heteronormative and pro-consumer practices.